II. Information we collect about you and how we use it. To provide you with information about our products and services and your Suburban Propane account. To deliver products and services to you. To bill and collect payment from you. To improve your experience on our websites. Personal Information is information that identifies you as an individual. It may include your first and last name, billing, mailing and delivery address, email address, telephone and fax number, service account number, and your purchase or consumption history. You are not required to provide any Personal Information in order to visit our websites. We may collect your Personal Information if you request information about products and services, and when you register for promotions or sign up for service. When you voluntarily submit your contact information (e.g. name, address, email address, telephone number) via the Suburban Propane website, you consent to receive information from us about our products and services. When you send us an email, we will retain your email, email address and our response. We may use this information to answer your follow-up questions and measure how effectively we address your concerns. We may ask you to voluntarily provide us with information about your interests, demographics, experience with our products and services and contact preferences. If you provide this information, we may use it to send you offers of products and services customized for your interests. We may collect Personal Information from other sources, for example, from calls you make to our customer service representatives or visits you make to service locations. We may combine Personal Information from other sources with Personal Information that you provide online. Personally-Identifying Information is information such as a credit card/debit card number, bank account information, Social Security number or driver’s license number in combination with an individual’s name or other information that can be linked to an individual. Suburban does not collect Social Security numbers or driver’s license numbers online. We will ask you for a Social Security number or driver’s license number only if necessary to perform a credit check, and will not share or use this information for any other purpose. We may collect Personal Information when you set up a MyAccount Customer Portal at account.suburbanpropane.com, view or pay a bill online, or make changes to your Suburban Propane account through the MyAccount Customer Portal. If you ask a Suburban Propane customer service representative for assistance in setting up or utilizing the MyAccount Customer Portal, you may choose to provide the representative with your bank account, credit card or debit card information, but you are not required to do so. Information about your website activity. We may use anonymous information about what website you came from for advertising placement and for tracking the effectiveness of advertising. At this time our websites do not respond to “Do Not Track” signals transmitted by browsers. Information that third-parties may collect about your activity on the Suburbanpropane.com website. Third-party services, such as Facebook tracking pixels, Google Analytics, or other data aggregators may collect user information on Suburban’s website. They do not provide information back to Suburban that links user website activity data to specific individuals. Some of these services may be able to link the user’s activity on the Suburban website with other data and target a message to a specific user when the user is on another web or social media site. If you have questions about an ad or other targeted content that you receive, or how third-party services use your data, you should contact the third-party services directly. III. How we share the information we collect about you. We may share your Personal Information with service providers, so that they can provide you with information about our products and services and perform billing and payment functions. We may share your Personal Information and in some cases your Social Security Number or Driver’s License number with credit bureaus and consumer reporting agencies, to the extent necessary for them to provide services to us. 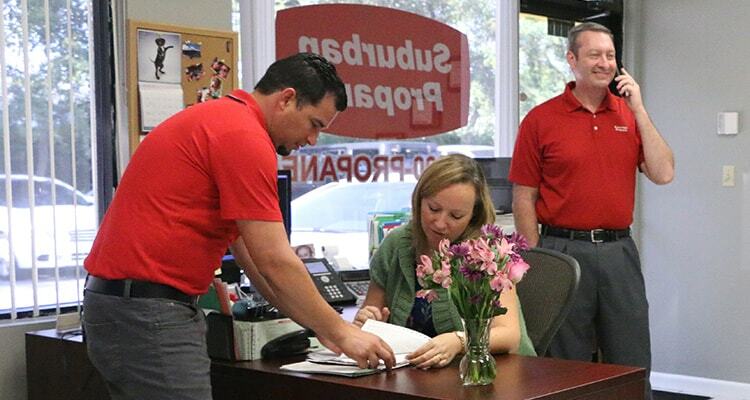 We may share your Personal Information with subsidiaries or affiliates of Suburban Propane, so that they may send you information about special offers or products and services that may be of interest to you based on your purchase history and other information that you have given us. If we sell, transfer or otherwise share some or all of our assets in connection with a merger, reorganization, liquidation, dissolution or sale of assets, we may transfer your Personal Information without your consent. We reserve the right to release your information to cooperate with any law enforcement or other governmental agency’s investigation of any fraudulent or illegal activity on or through our websites, enforce the terms of any agreement or protect the rights, property or safety of our users, the general public and Suburban Propane. Under such circumstances, we may be prohibited from providing you with notice of such disclosure, and we reserve the right not to provide you with such notice. We may share aggregated and statistical non-personal information with third-parties to better understand how our websites are used and to improve user experience. IV. Safeguarding your Personal Information. Suburban Propane recognizes the importance of safeguarding your Personal Information and your Personally Identifying Information and we endeavor to maintain reasonable security measures to protect against unauthorized disclosure or access. No method of data transmission or storage is 100% secure, so we cannot guarantee the security of your Personal Information or Personally Identifying Information. Use of the Suburban Propane websites by a child under age 13. The content on Suburban Propane websites is targeted at adults. Suburban Propane will not knowingly collect information from children under the age of 13. If a child provides us with any Personal Information, the parent or guardian should notify Suburban Propane by sending an email to pr@suburbanpropane.com. Upon receipt of the email, Suburban will delete the child’s information, and will remove it from any promotional contact list and database. V. Opting out of promotional messages. If you register for the My Account Customer Portal, you will be given the opportunity to choose not to receive our promotional messages. If you would like to unsubscribe from receiving these promotions, please send an email to MyAccount@suburbanpropane.com. You may also click on the UNSUBSCRIBE link contained in any promotional email we send you. To find out what information Suburban Propane has collected about you, and how to update or correct that information if it is outdated or inaccurate, please contact pr@suburbanpropane.com or (877) 976-6866.